I'm going to assume you've heard of hearing aids. You've most likely heard of cochlear implants as well. If you haven't, well, that's another super long post for another day. I'll do an entire post (perhaps series of posts) on cochlear implants and their pros and cons and the controversy that surrounds them. Just FYI, it's a big deal. 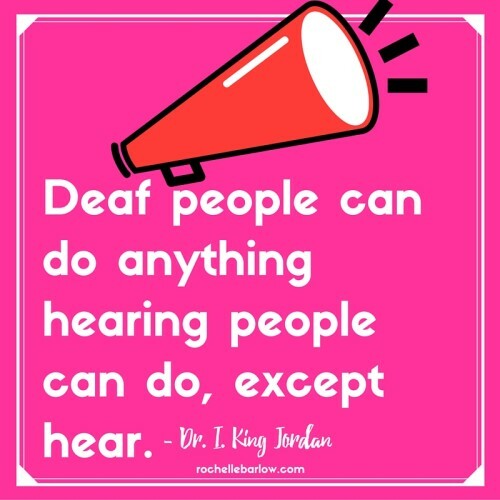 So make sure you don't walk around asking every Deaf/Hard of Hearing person you know why they don't have one. For now, let's get into the sweet devices they've got! Well, Rochelle, they can't talk on the phone! Sure they can. Let me give you a run-down of the different phone possibilities. What is it? In short: a keyboard type device with acoustic cups built in. You set your phone on top of the cups and you and the other person can type messages back and forth. Deaf/HOH people had texting slang down before texting even existed. True story. When you're using a TTY you can't interrupt each other or the messages will get garbled and you won't know what's going on. They developed a shorthand to let the other person know when they were done typing and that it was their turn to respond. The cool thing about a TTY is that you can talk to someone even if you don't have one. There are relay operators with TTYs. They can take a call from a D/HOH person to a hearing person (including 911 calls) or from a hearing person to a D/HOH person. They'll tell you what is being typed/said and relay what you are saying/typing back to the other person. It does take some getting used to, but it's a fabulous service. I had a lot of fun using a TTY to talk to a few friends! Here's a video on YT that will show you what a TTY looks like and its components. I still remember when these came out. Oh boy, it was an exciting time in the Deaf Community! I was blown away by the technology and kept telling everyone about it, even if they didn't care at all. Ha ha. Nowadays it's not such a big deal. If you know what Skype is, you pretty much understand what the videophone is. The videophone is done in two ways. It can be hooked up through your TV screen and phone line. If you're D/HOH you can call another D/HOH person and instantly see one another and can use ASL to communicate rather than a TTY. Much faster and easier. Plus, you are communicating in your own language (remember, English is not their first language) and that's always better. If one of you does not have the videophone set up you can call in to the Video Relay Service (VRS) and they can relay your call to the person with the video phone, or to the person without the video phone. Here's a cute video of a girl talking about the VRS/videophone. It's sort of an ad for Sorenson, but you can see a few clips of the videophone in action! This is a phone that can amplify the tones of a phone in a varying range of decibels. This is particularly helpful for those that are Hard of Hearing, and for those that are D/HOH later in life with enough hearing to benefit from the amplification. This is for those that prefer to use their voice when communicating, but will not hear the other end. There is a relay service associated with this method of talking on the phone. The person speaks into the phone as a hearing person would. Then they receive the response via text on the phone's display screen through an operator. The CM detector is super important to have in all homes. These special types of detectors have extremely loud alarms, horns, and have strobe lights as well. We're not talking weak-sauce light bulbs. Think airport runway flashing lights and beams that could shine through your body! These operate in the same manner as the carbon monoxide detectors, but also have the feature of the shake-up system. You place it under your mattress and strong vibrations will shake you awake to alert you that there's a fire or smoke. Deaf/HOH people have babies too! They want to know when they're little sweeties are crying, fussy, or upset. You plug a transmitter near the baby's crib (or other area the baby is in) and adjust the setting to pick up the level of sound you want to be notified of. It will send the signal to a receiver that you have with you. It won't flash a light or alarm in the baby's room, which is great! The cool thing about it is you can have it vibrate, flash lights, or have it wired in to the other systems in your home. Add an alarm to your doorbell, or hook up a whole system to your doorbell. There's chimes (loud) and light flashes as well. You can have it go off in several areas of your home, and not just by your front door. I know many hearing people that could benefit from this! I am a heavy sleeper. I need some crazy loud alarm system to wake me up. I actually have to set two alarms to wake up. There are alarms for the Deaf that have several options to them. You can have a flashing light, loud sounds, and vibrations under your pillow. Many alarm clocks will do all 3 at once. I don't think you could stay asleep if you tried. There are alarms that are purely bed shakers. Stick them in your pillowcase and set your alarm on your phone. It'll shake you awake! Tornados, hurricanes, floods, and other severe weather occur everywhere. This device is hooked up to the weather alert system. You set it to the county you're in and you'll be alerted via sound and light when something is happening near you. The Amber Alert system is also included in these types of alerting devices. You can set this up anywhere in your home or office. Simply set it near an area where you want to be alerted of any loud sounds that can occur. You can set its sensitivity level and it has a system for false alarm sound prevention. You hook it up to the system and you can have whatever light, sound, or vibrating device alert you to this sound. It can be near a baby, a child, a door, a garage, an oven, etc. When a noise occurs that you want to be notified of, it can flash the lamp in your office, or any other alert source you want. This can be used at work or at home. Instead of using a pager (a la 90s) or a cell phone to get a hold of someone, you can send a page alert. This can be a pager that the person wears or mounts on a wall. They're alerted by an alarm, a vibration, or a flashing light. They can then hit the button that they've received the page and then can respond to your page in whatever manner you have set up. Dinner's ready? Bam, click the pager. You need to let your co-worker know that you need them on the factory floor? Click the pager. This works from Deaf to hearing and hearing to Deaf. Here's another video showing you how the silent call alarm system works. If you check out the channel that made this video, DeafTechNews, you can see other devices they check out as well. But how do they know which alert is which? As you can see all these devices flash lights, vibrate, and emit super loud alarm sounds. How do you differentiate between them all? Many of the devices will allow you to set patterns to the alerts. For instance: flash, flash, pause could indicate the telephone and flash pause flash indicates the doorbell. You can also set up the light sources to be in specific lamps or areas of your house. The lamp to the left of the bed can indicate the baby is awake, while the lamp to the right is the motion detector for the burglar alarm. These devices are not cheap either. Many of the systems start at $50 each and move upwards to $600 or more. If you think of all the devices you'd want in your home in the various areas and needs you have, you'll see that it adds up very quickly. I didn't even cover every single device! There are many more out there that can be extremely beneficial to any person that's Deaf or Hard of Hearing. What things about the way people that are Deaf or Hard of Hearing live are you curious about? Let me know in the comments below and I'll include it in the next post!